The joy of chocolate tea is something I discovered on a trip to the US, where The Republic of Tea displays its wares in most of the larger food stores and with flavours such as Coconut Cocoa and Red Velvet Chocolate, temptingly packaged (and I know, the packaging shouldn’t make a difference but it does) I took the plunge and have never looked back. The added joy of chocolate tea, particularly for chocoholics, is of course that it’s completely guilt free. About to run out I searched the web and came up with some alternatives, all of which I shall taste, although stock up on every trip across the pond. 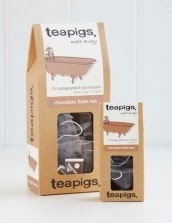 You’ll find chocolate tea by a variety of producers in the UK, including Tea Pigs, but also at Amazon by The English Tea Shop. As a non normal tea drinker, if you know what I mean, in that I can’t and don’t compare the complexities of Lapsang, Earl Grey and English Breakfast any more than I can and do red wine (unless it’s a Chateau Latour, of course……..) I’ve been totally won over by teas with names including Holiday Spiced Plum, Hot Apple Cider and Caramel Apple. Wouldn’t you be? All of the teas from the Republic of tea are wonderfully full of flavour. The Republic of Tea will ship to you in the UK, and their presentation is totally gift-worthy, the only problem is that you’ll have to pay shipping and duty on top of the basic price. If you're tempted to order I would make it a bulk order so you don't have to pay extra for the shipping each time. For my part I'll stick to my chocolate tea.....for now.